Fall...in love with this gorgeous polish!! 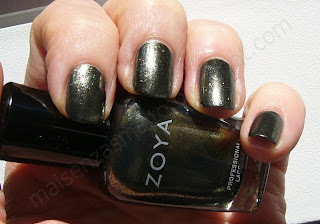 This is Edyta from Zoya Wicked Collection (Fall 2010); they define it perfecly as complex mixture of gold, olive, blue-green and smoky grey with a sparkling metallic finish . Indoors it seems mostly a "metallic" green but under direct sunlight...A gorgeous, sparkling mix of gold, green, grey (you can click on first picture to enlarge it and enjoy sparkles)! Removing the polish I realized that it should have a blue base (first color remaining on soaked cotton and *sighs* last one to come off from nails). Really smooth application (I <3 Zoya polishes), after first coat the surface was 99% opaque (I tend to appy thick layers) so I did quickly another one and took pictures (no top coat). I've never been a huge fan of green polishes (or at least I didn't tought I was) but this one is amazing, buy it!! Uno smalto bellissimo della collezione autunnale Wicked di Zoya. Loro lo definiscono un complesso mix di gold, olive, blue-green and smoky grey with a sparkling metallic finish. Non mi viene in mente una descrizione migliore: alla luce naturale (interno) sembra più che altro verde "metallico", ma sotto il sole esplode in un luccicante mix di oro, verde, grigio!! Togliendolo ho notato che il colore base dovrebbe essere blu, sulle unghie non si nota particolarmente ma è il primo colore che resta sull'ovatta (e anche l'ultimo a venir via dalle unghie...sì macchia un pochino ma niente di grave). Applicazione ottima, dopo la prima mano era quasi perfetto (però io tendo a dare passate "dense") e giusto per rifinire qualche zona non uniforme ho steso un'altra mano. Niente top coat e via le foto! Io non sono stata mai un'appassionata di verdi (credo, anche se ultimamente ne ho comprati alcuni - leggo troppi nail blog :-) ) però questo veramente vale la pena, per l'autunno è stupendissimo! !